Tomorrow is all about mom, but before that, we still have today to get through... and right now, it is all about everything digital. So with that being said, welcome to Digital Digest! 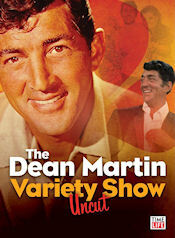 This week, in addition to our regular features, we've got a review of Time Life's upcoming release of The Dean Martin Variety Show - Uncut. Let's get going! This week has been a painfully slow week for news, and the only real story is the release of a DVD set which has in fact already been released. Inception Media has apparently picked up the rights to the classic series The Real McCoys, but since the previous releases are out of print, they'll be starting over from the beginning, with The Real McCoys - Season One. The previous releases of this series from another studio included syndicated versions of all of the episodes, and there is no indication that these will be any different... but we hope that is incorrect, and if it is, we'll definitely let you know. So, what is the deal with Benson - The Complete Second Season? 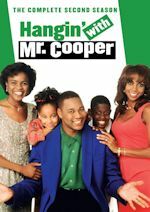 After it was suddenly pulled last month and rescheduled for May 1, we reported to you last month that the title was pulled due to the set being defective, missing the first episode of the season, containing two episodes of the third season, and the episodes on the third disc all being out of order. Well, now, we have received our review copy (look for our review soon), and can report that the set has improved. The first episode of the season has been added to the beginning of Disc 1 on the "improved" version. Disc 3 is still the same, but it actually isn't a mistake that the episodes are out of order. Apparently, airdate and production order was the same for all of the episodes on the first two discs, but for the episodes on Disc 3, those were aired in a different order than the order in which they were produced... so really, it isn't a mistake, but rather just confusion (although we think most fans do prefer airdate order). And the first two episodes of the third season are still on the end of Disc 3, but that isn't exactly a bad thing, but rather a nice little accidental bonus. The important thing here is that we do have all of the second season episodes in the set now. We'll have a review of this "new and improved" set very soon. Tuesday (May 15) has just one release that is of any interest to us, with Shout! Factory's release of Hazel - The Complete Third Season. We just received a review copy of this set today, but we'll have a review of it before Tuesday. Speaking of reviews, look for our review of Fantasy Island - The Complete Second Season sometime very soon as well... even though the set came out May 8, we just received our review copy of this set, and will have our review for fans wondering what it has in store for them (don't worry, it all looks great!). In 1965, NBC was eager to give Dean Martin a TV series. However, Martin wasn't interested in doing a TV series, and offered to do a series only if NBC could meet his demands, demands which he believed no network would ever meet, such as a high salary and being able to show up to do the series for literally one hour per week, with no rehearsal or preparation. Much to his surprise, NBC did agree to those demands, and out of this came The Dean Martin Show, a series which ran for nine years on NBC, airing at 10 PM on Thursday nights for eight of those years. Coming across as a man who just didn't care (but wanted to have fun), Martin hosted the variety show for 30 weeks per year, while often drinking (though it was purported to have been apple juice) and chain-smoking his way through each and every episode. 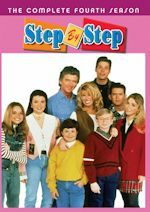 Several releases of clips of episodes have been released over the years, including some which resulted in lawsuits from NBCUniversal against another company which released the series. All of these releases have had one thing in common, though. They were all releases with essentially the best clips of the series. That is, until now. Because now, Time Life has licensed... legally and authentically... from NBCUniversal six complete (or technically, almost complete) episodes of the series for their release of The Dean Martin Variety Show - Uncut. As we've already mentioned, the set contains six episodes of the series on six discs. Among the episodes included here, we have one episode from each of seasons 1, 2, and 5, and three episodes from season 3. 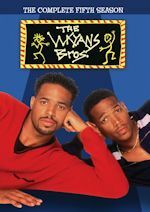 In these episodes, you'll primarily find the typical staples of a variety show of the era, a series with a lot of singing and dancing, along with a few skits and often a stand up comedian performance along the way. The singing and dancing is especially prominent in the first episode, where we get to see a West Side Story medley from The Lettermen, and a (somewhat disturbing) "Strongman Act" performance by David & Goliath, two guys giving an onstage performance wearing nothing but a pair of gold briefs and gold slippers. The second episode shows a few performances from Leslie Uggams, who would later have her own variety series. On the third episode, we get to see a few comedy bits from Buddy Ebsen and Dom DeLuise. Bob Newhart makes one of his earliest appearances in the fourth episode, although it isn't his first. In fact, he is joined by two of his co-stars from the TV series The Entertainers in this episode: Caterina Valente and Dom DeLuise. In the fifth episode, Orson Welles stops by to give us a reading from a Shakespeare play and a magic act which he entertained U.S. troops with during World War II. Finally, in the sixth episode, Broadway star Zero Mostel and Tommy Tune stop by to give a dance routine. So, it was mentioned a bit earlier that the episodes were "almost" complete. What do we mean by that? Well, Time Life made a bit of a blunder in calling this set uncut, because by their own admission, one of the episodes (January 25, 1968) is missing a song from Dean Martin and Buck Owens because the original master was destroyed. I honestly believe that is the reason which the song is missing. The other performances from Buck Owens are included in the episode. Still, I think that perhaps the episode should have been changed to make this a truly unedited set, because everything else looks unedited. Each episode even has original NBC "in color" bumpers, original NBC closing logos, and even commercial bumpers... although the names of the sponsors in the bumpers are removed and we get a somewhat strange 30 second instrumental interlude of "Everybody Loves Somebody" with a photo of Martin smoking a cigarette in the background. Episodes included, along the runtimes and guest stars, are as follows. The set comes packaged in a standard Viva case. On the cover, there is a large photo of Martin, along with a smaller photo of him. There is another photo of him on the back, along with a brief description of the series. Inside, you'll find the three discs, each containing two episodes. The disc artwork simply has the title logo of the DVD set as featured on the cover on each disc. There is also a nice episode booklet inside, which includes a page for each episode featured on the set. Here, you'll find all of the guest stars, original airdates, a list of skits, and a brief "analysis" of the episode. On the main menu, we get a still photo of Martin, along with a bit of singing and dancing from the series. Options on the main menu include Play All and Episodes. When you select Episodes, you get a list of the two episodes on the disc (they really could have just put all of this on the main menu). Upon selecting an episode, you get a list of scenes where you can start the episode, and they have created a chapter for each of the skits on the episode... meaning you'll get about 20 chapters per episode, all appropriately placed. I don't think that the video and audio quality is going to leave anybody too impressed. After all, these episodes were intended to be aired once... and only once. By and large, that is the only airplay most episodes of this series ever received. Given that, however, the quality is better than one would expect for something where preservation of the episodes wasn't really intended at all. The video quality is very soft and dull, and the audio has a very distinctive hiss in it. Unfortunately, the episodes do not have any subtitles or closed-captioning. There are no special features on the set. Interviews would have been nice, although I'm not sure exactly who they could have interviewed aside from perhaps Bob Newhart or Robert Wagner... everybody else featured on these episodes is either dead or so far away from showbiz these days that it would be a real stretch to bring them in. Personally, these variety series from this very early era have very limited appeal to me, and while it was somewhat interesting to watch these, I can't say that I was that impressed with what I saw. The singing and dancing was a bit too much for me, and the comedy of the episodes is a very distinctive style which doesn't age very well... and furthermore, the stand-up comedy in the episodes was (in my opinion) just plain awful. 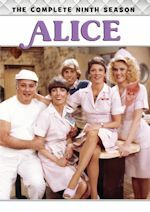 It doesn't help that a majority of the performers featured in the episodes were people I've never even heard of, and even some of my favorites (such as Buddy Ebsen and Bob Newhart) delivered a somewhat disappointing performance. But at the same time, these variety shows have a very strong appeal to those who grew up with them, and fans of Dean Martin are certain to appreciate this. It would be nice to see more complete episodes of this series to come in the future, but if they do, I hope that they include some "better" episodes if they are available. In a sense, I feel like this collection was an almost random collection of subpar episodes. But on the other hand, I'm sure everybody loves a set like this... sometimes. Miami Vice Chronicles (www.miamivicechronicles.com) - In the '80s, there were essentially three genres of television which dominated: the family sitcom, sudsy primetime soap operas, and of course, the action series. There were plenty of the action series, from Magnum, P.I. to Simon & Simon to Hunter to The A-Team to much, much, much more. However, in 1984, Michael Mann "reinvented" the genre, to turn those series (which were mostly fun stories which could only be told in a TV series) into a lavish and expensive affair, creating episodes which were like a mini-feature film and featured all of the hottest music of the era. This is precisely what he did with Miami Vice, one of the coolest series of the '80s, and a series which even stands to this day as one of the coolest series ever. The series has a rather large fan base around the world, and there are actually quite a few good websites for the series out there. One of the best ones, though, is Miami Vice Chronicles. The website began in 1996, but actually, the research for this great site dates all the way back to 1988... probably before some of our readers were even born! Quoting the webmaster from the About page, "In 1988, during the final season, I took it upon myself to research the one final iconic piece of the series that was incomplete for us: the music. That research led to me spending almost 2 weeks huddled over microfiche machines in my university’s graduate library, poring through the archives of USA Today’s TV section, carefully copying down the original episode descriptions, air dates, guest stars, and most importantly, the songs used for that episode (a feature that only USA Today provided for the series)." Needless to say, this website demonstrates a lot of hard work that has been done over the years, and represents a highly valuable website for fans of the series. For example, in the Photo Gallery, you won't just find a bunch of press photos which are reproduced by the masses. Instead, you'll find things such as all of the pages from the official series calendars which were published in the '80s, memorabilia related to the series, books, and magazine covers. The Episode Guide gives very detailed information about the cast and crew for each episode, along with decent descriptions for the episodes. One of the best resources, though, is the Music Guide, where you'll find a listing of every single song from every single episode of the series. There truly is nothing to dislike about this site, our Click of the Week.